Currently, issues are scheduled by the scheduling algorithm of Portfolio for Jira. The algorithm considers several issue details, to automatically create a sensible timeline of the work that's relevant to you. With the algorithm, it's easier to spot bottlenecks — this gives you a chance to handle these potential problems even before they happen. As handy as the algorithm can be, you don't really see how it works out your schedule. Ultimately, you're only given the resulting schedule. With experience and some inside knowledge, let's say that you know that an issue should be scheduled earlier than what has been plotted by the algorithm. To get the algorithm to schedule the issue the way it should be scheduled, you'd need to experiment by changing some issue details. With the new experience, you can now quickly drag and drop the position of an issue in the timeline, to schedule work your way. You’ll no longer have to guess what you should do, to get issue PERF-5 scheduled on 16 August 2018. Note that in the new experience, manual planning and optimized planning are independent of each other. It's not meant to be one method or the other — you can actually do both when planning work. For example, during the early, high-level planning stages, you can start by manually creating and scheduling issues in your timeline. 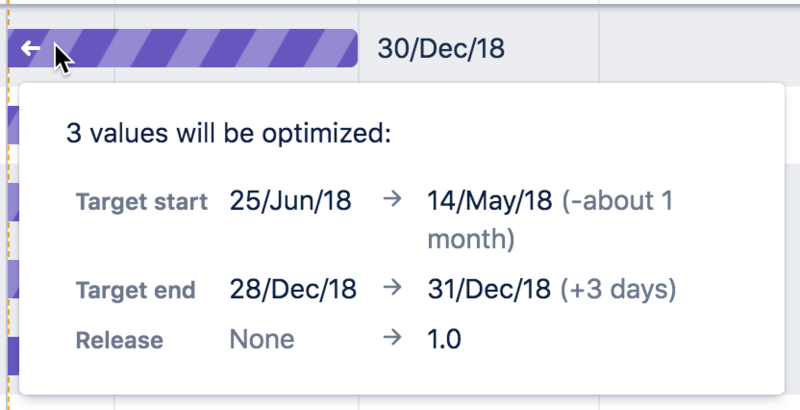 Later on, when your teams add more accurate dates and estimates to their work in Jira, you can then optimize your plan to see if your high-level dates make sense. Note that in the timeline section, the schedule blocks of the optimized items will appear in purple stripes. Similarly, in the fields section, the corresponding issue details will also appear in purple stripes, although of a lighter shade.